Mr. Macrae became associate administrator for primary health care in the U.S. Department of Health and Human Services' Health Resources and Services Administration (HRSA) in May 2006. As head of the Bureau of Primary Health Care (BPHC), Mr. Macrae manages a $5 billion budget that supports nearly 1,400 health centers which operate more than 11,000 service delivery sites in every U.S. state, the District of Columbia, Puerto Rico, the U.S. Virgin Islands, and the Pacific Basin. Serving nearly 26 million people nationwide, these centers provide cost-effective, comprehensive, and patient-centered care, coordinating a wide range of medical, dental, behavioral, and patient services. 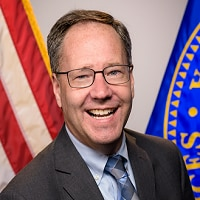 Mr. Macrae also served as Acting Administrator for HRSA from April 2015 to April 2017, where he oversaw more than 90 programs that provide health services to tens of millions of people, including people living with HIV/AIDS, pregnant women, mothers and families, and those otherwise unable to access quality health care. Prior to his years in BPHC, Mr. Macrae served as Associate Administrator for HRSA's Office of Performance Review (OPR) from 2000 to 2006, where he oversaw the work of staff in regional divisions across the country. OPR was previously the agency's focal point for reviewing and improving the performance of HRSA-supported programs in states and communities. Mr. Macrae also served in several capacities at BPHC from 1992 to 2000. As the bureau's director of the Office of State and National Partnerships, he worked with national and state associations across the country to increase access, reduce disparities in health outcomes, and improve the delivery of health services to underserved populations. Before joining HRSA in 1992, Mr. Macrae was a Presidential Management Intern at HHS, where he worked on both the Medicare and Medicaid programs as well as in the Department's Office of Planning and Evaluation. Mr. Macrae has received numerous awards, including the Hubert H. Humphrey Award for Service to America (2015), the HRSA Administrators Award for Equal Opportunity Achievement (2014), the Presidential Meritorious Executive Rank Award (2010), HRSA Administrator's Award for Excellence (2005), Special Citations for Outstanding Individual (1996) and Group Performance (1996, 1999, 2001, 2008, 2009, 2010 and 2012), the National Health Service Corps Recognition Award, (1998) and the BPHC Special Recognition Award for Leadership (1994). Mr. Macrae earned his bachelor of arts degree in sociology from Illinois Wesleyan University, a master's degree in sociology from Duke University, and a master's degree in public policy from Harvard University.